Here are some ideas to help you avoid waste and reduce the amount of waste you create. Use the waste triangle to help you achieve an overall reduction. Remember the three R's - Reduce, Reuse and Recycle. Look at the contents of your wheelie bin. What should not be there? Set up a system in your house or garage to make recycling easy for every member of the family. Then encourage everyone to use it. Aim for ZERO WASTE by having as little in your bin as possible. Avoid disposable and plastic items where possible. Select products with minimal packaging. Buy 'loose' items rather than pre-packed. Plan your meals, and shop with a list. Buy in bulk whenever possible. You could shop for bulky, non-perishable items as a family group and then split the packs. Avoid using tinfoil and cling film to cover foods. Use dishes with lids instead. Buy local produce where possible, or food items with the fewest 'food miles'. Better still grow some of your own vegetables. Just because an item is packed on the island or has a 'Manx' sounding name, doesn't mean that it is produced locally. And it may just have been packed here. The main ingredients could have been sourced elsewhere! Check the label carefully for country of origin. If appropriate, use the economy wash on your dishwasher. Use eco-friendly dishwasher tablets. Use china or enamel crockery rather than plastic or paper. Use real cutlery rather than plastic. Manx tap water is pure and tastes good. Keep a fresh jug of it in the fridge rather than using bottled water. It is also much cheaper. Wash your clothes at a lower temperature and swap to eco-friendly washing powder. This is better for the environment. Please be careful about what you flush down the loo. Items such as cotton buds and other forms of plastic cause obstruction in the sewers. Eventually such items may end up at sea polluting the coastline and causing a hazard to wildlife. Reuse scraps of paper or the backs of cereal packets for writing notes and shopping lists. Take cloth bags when you go shopping. ZWM cloth bags are available for �2 at The Green Centre near Little Shoprite in Douglas. Don't accept plastic bags from retailers, and try to reuse any you do have. Pack school lunches in reusable containers with lids. The inner wrapper from cereal packets can be used for wrapping up children's sandwiches or separating the contents. Borrow, swap or buy second-hand books rather than buying new. If you need equipment for a short time only, hire rather than buy. Buy second-hand items rather than new. Try the charity shop or garage sales. Look for items in the newspaper. Pass unwanted items on to friends and family. Leave unwanted items at an amenity site for others to take and use. Make really good use of your compost bin or get one. 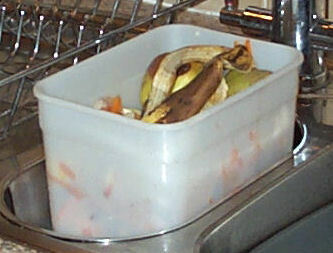 Keep a small container by the sink to put items for the compost bin straight in. Read up on recycling. See item specific recycling on this website. Recycle wherever and whenever possible. Now visit the Links page for further tips and suggestions from other websites. At work there are plenty of opportunities, to reduce waste and to buy recycled goods. Again, the best place to start is by having a look at what is thrown away. Every organisation should have a policy on 'waste disposal' (resource recovery!). All policies work best if staff get involved and are allowed to contribute their ideas. Ask everyone to participate. Make sure you have a policy or work towards one. Put most of your effort into the prevention rather than the disposal of waste. 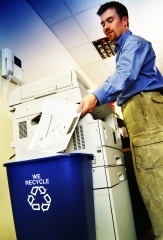 Set up collection points for print cartridges, batteries and mobile phones. Avoid disposable cutlery and crockery. If cup washing becomes a problem, allocate a different person each day to wash up! Encourage staff to switch off lights and equipment. For local help contact the Waste Operations Management Unit (WOMU) at Department of Infrastructure tel: 686540. Don't forget you may be wasting water, electricity, gas and petrol as well as paper and cardboard. ZERO WASTE is based on nature. Resources are recycled back into the earth time and time again. 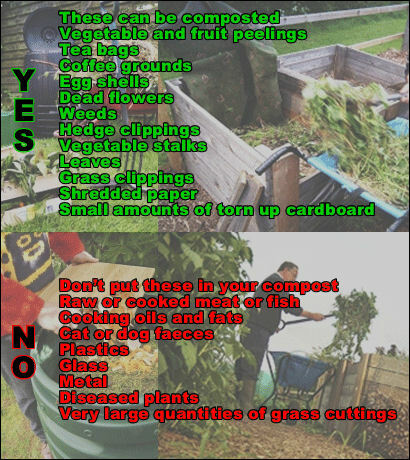 Your first priority should be a compost bin and/or a compost heap. Basically you can just heap up kitchen and garden waste and then leave it to rot down. It is easy to do. You can buy a large plastic compost bin from most garden centres or make a larger one out of wooden pallets. About a third of everything that usually goes in the wheelie bin could be composted. Keep a container on the kitchen windowsill for your peelings and other food waste. Empty it and wash it regularly. Make sure you add the correct ingredients for good quality compost mixing brown and some green waste. Stir or turn the contents of the bin or heap occasionally to mix them. This assists the composting process. 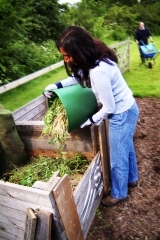 Speed up the composting process still further by adding compost worms. If space is limited consider a wormery. See Links pages for address and details of supplier. Add some water to compost heaps if they get too dry. Add shredded newspaper if the heap gets too soggy. Invest in a good shredder for the bigger, woody stuff, share one with a friend or neighbour, or hire one if you have a lot of waste wood. The shreddings can then be added to your heap or used as mulch around the garden. Shredded office paper, makes an excellent addition to compost in small quantities. It also makes very good bedding for horses and poultry, pet rabbits, Guinea pigs or hamsters. (Remove the staples and any plastic windows from envelopes, before shredding). Do you know anyone who keeps hens? Give undamaged plastic plant pots to your local garden centre. Recycle your Christmas tree after use. The shredded trees are used to make compost. Various local authorities now shred Christmas trees. See Links pages for address and details. Reduce and reuse is the aim here. Not only will this help keep costs down but you will be helping the planet in the long run. Disposable nappies pose a huge problem for the environment. If put in the wheelie bin, they have to be incinerated at great cost to the local authority. Consider using real nappies instead. All babies born in Nobles Hospital use real nappies. Resist the temptation to buy baby equipment you do not need. Reuse cots and prams, but not mattresses. A fantastic selection of pre-owned, good quality items can be found in charity shops, second-hand stores and car boot sales. Look for second-hand items on notice boards in supermarkets and shops. Look also in the classifieds section of the local newspapers and websites. Babies don't know the difference between designer clothes or second-hand. Not only will you be saving money by using second-hand clothes, but creating a better world for them to grow up in. Avoid pre-packaged items in your child's lunch box. It is also much healthier if you include good quality, fresh foods. Encourage your child to eat fresh fruit, rather than sweets, biscuits or crisps. Walk your child to school or share school runs with another parent. All areas of the island are covered by the car sharing scheme. Has your school considered a 'walking bus' scheme? It is best to have a whole school approach to 'resource recovery' that involves pupils and staff. In other words, avoid waste and increase recycling opportunities. One of the best schemes is 'Eco-schools' which is run by Encams, (formerly Keep Britian Tidy). Eco-schools is an international award winning scheme. For further details see the Links pages. Here are some more suggestions and ideas to help get you started. As usual an examination of the content of the bins is a good place to start. Pupils and staff should all be made aware of the waste hierarchy. It is vital that children are educated about waste from an early age. This needs to start in nursery school. Concentrate especially on reducing waste paper. 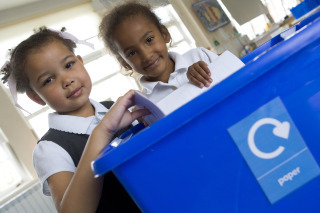 Ensure the school is buying recycled paper and ink cartridges. Collect used ink cartridges for refilling. For information and schools see further details on the Links page. Now visit the Links page for further tips and suggestions from other websites. You will also find lots of information for teachers on these sites. Site design & Content � Zero Waste Mann. All rights reserved.